Just how unregulated can the Forest City Ratner Atlantic Yards mega-monopoly be? Probably more unregulated than anyone can possibly imagine. Anyone, except perhaps the developer/subsidy collector himself, Bruce Ratner, who seems always to be able to envision the next steps to which his firm’s lack of accountability can be taken, and then implement it. The fact Atlantic Yards will be so blatantly unregulated should make clear to those considering the matter that seeking to regulate a continuing Ratner monopoly of vast size is not a solution. What is really needed is for the unjust and unjustifiable Ratner mega-monopoly to be broken up. The Forest City Ratner monopoly hasn’t consented to be regulated by the government in exchange for its special [monopoly] status. For all intents and purposes it is the reverse. The government doesn’t regulate Forest City Ratner; instead Forest City Ratner has been regulating the government. To the extent that Forest City Ratner’s real estate industry development activities ought to have been subject to time-tested and carefully evolved regulations normally applicable to other participants in the industry, like zoning and review processes such as the City Charter’s ULURP (“Uniform Land Use Review Procedure”) or SEQRA (the “State Environmental Review Act”), Forest City Ratner used its political capturing of the state’s Urban Development Corporation (aka and dba: “The Empire State Development Corporation”) in order regulate government and effectively avoid any meaningful application of these or similar restraints as well as the public protection that was thereby intended. Similarly, when IRS regulations said that interest on bonds issued for the Forest City Ratner arena (now the Ratner/Prokhorov “Barclays” arena) would be subject to income tax, New York officials swooped into action to lobby for a special loophole exempting interest on Forest City Ratner’s bonds from the taxes that regulations would have required anyone else to pay. 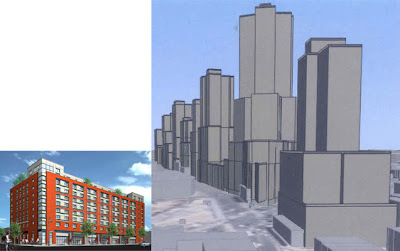 When in 2007 the state legislature planned to enact across-the-board reform of the city's 421a property tax incentive program applicable to the building of new apartment buildings, a special treatment loophole was created to excuse the Atlantic Yards mega-project from supplying affordable housing on the same terms required for any other project. The list of accommodations to specially excuse the mega-monopoly from all sorts of regulatory and procedural requirements is too extensive to attempt to list them all here. Another escape from regulatory safeguards worth mentioning is how the MTA in connection with the land it was furnishing the developer managed to confer extra benefit and a lowered cost on the project by not complying with provisions of relatively new public authority reform legislation intended to prevent abusive favoritism. It makes sense that this Forest City Ratner mega-monopoly ought to be meaningfully regulated, because the government is paying with subsidy for so much of what is being developed, a proposed $2 to $3 billion, probably coming in at a figure at the higher end of that spectrum. It also makes sense to regulate because it is a vast monopoly and there is an American tradition of constraining monopolies that includes regulating them if those monopolies are permitted at all. How vast is the Ratner monopoly? 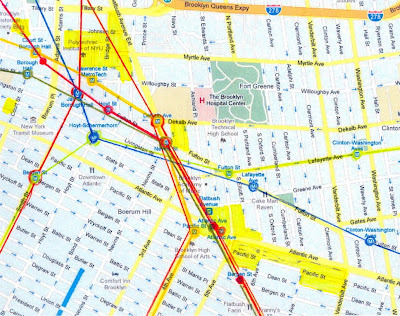 If you look at the maps above you will see that Ratner has more than 50 acres of some of the highest density real estate in Brooklyn sitting astride an important series of stops on the Borough's key subway lines. The Atlantic Yards plan, while nominally involving only 22 acres, actually serves to give Ratner ownership of 30 contiguous acres. For more details you can read: Saturday, November 21, 2009, Mapping Out Forest City Ratner’s Monopolistic Strategy of Subsidy Collection and Thursday, January 7, 2010, An Updated Map of Forest City Ratner’s 50+ Acre Prime Brooklyn Real Estate Mega-Monopoly. The community is having to figure out how to refer to a landscape where everything is Ratner owned: Ratnerville? Ratner Heights? The supremely odd thing is how the Ratner monopoly attained its vastness. When the government doesn’t regulate monopolies it normally steps in to break them up. In the case of the Ratner mega-monopoly it was the reverse: The government stepped in to create it. Were it not for the assistance the state ESD provided, conferring upon Ratner the power to abuse eminent domain, the Ratner mega-monopoly could never have come into existence. A second odd reversal is manifest: The U.S. Supreme Court had never ruled that the creation of a monopoly is an acceptable purpose for which eminent domain may be used; it has ruled, however, that eminent domain may be used to break up real estate monopolies. The case was Hawaii Housing Authority v. Midkiff, 467 U.S. 229 (1984)*. So in theory while government could use eminent domain to break up Ratner's real estate monopoly, there is nothing in terms of United States precedent that says eminent domain can be used the way it was to create such a monopoly. As pointed out in the above Noticing New York article earlier this month, once upon a time the price in America for being allowed to exist as a monopoly was to consent to be regulated. I used as an example the permission that was given to the Bell telephone company, the incipient AT&T, via the Kingsbury Commitment of 1913, which was appropriate because I was pointing out the philosophical inconsistency in the anti-monopoly stance that the New York Times editorial page was taking in opposing “AT&T’s $39 billion attempt to buy the nation’s fourth-largest carrier, T-Mobile” while at the same time the Times has supported the Atlantic Yards monopoly. The Times, mind you, was not saying that an expanding AT&T monopoly should be allowed and then regulated; it was flat out opposing the monopolistic “anticompetitive threat” that would result from AT&T acquisition and absorption of T-Mobile. No More Mr. Nice Monopoly? In explaining what happened with AT&T and the 1913 Kingsbury Commitment I quoted extensively from Columbia Law professor Tim Wu’s excellent book “The Master Switch: The Rise and Fall of Information Empires” that beginning with the telegraph and telephone companies and then bringing us up through the advent of the Internet, is about the cycle and repeated pattern of information and communication empires and how they tend toward monopoly. I did this to compare and contrast the initial good intentions and public service commitment of the newly regulated early phone company with the Forest City Ratner monopoly empire in Brooklyn. The Forest City Ratner mega-monopoly is all the more pernicious in that it involves real estate, an industry for which it was not previously thought there was a reason to create monopolies, and also for the fact that the very extensive Atlantic Yards monopoly involves granting Ratner (with free and below-cost donations of property from New York city and the MTA) a monopoly over what is property that properly should be an inalienable part of the public realm, part of the “res publicae” or “res publica” (from which derives our word “republic”) that under Roman Law were inalienably public property, held in common, that no person could privately own.
. . . in a commercial culture, city streets are republic property . . . Notwithstanding that “res publicae” is supposed to include public parks and all the roads and streets the public needs to travel for purposes of public commerce, Atlantic Yards involves giving over all of the park space, plus the private roads, avenues and sidewalks that were previously owned by the public to the dominion or Ratner’s private monopoly ownership. That is about as far as we took the subject of the relationship between monopolies and government in the last Noticing New York post to which we have been referring, but it is not altogether that simple. Yes, there has been an American tradition of government constraining monopolies. That tradition involves the constraints of not permitting them at all, examples being the Sherman Antitrust Act of 1890, and the Clayton Antitrust Act of 1914, or constraining them through regulation as was done with the phone company pursuant to the Kingsbury Commitment. The tradition of government constraint of monopoly power in America even goes back to the framing of the Constitution as we shall see in a moment. But there have also been traditions of other sorts between governments and monopolies. 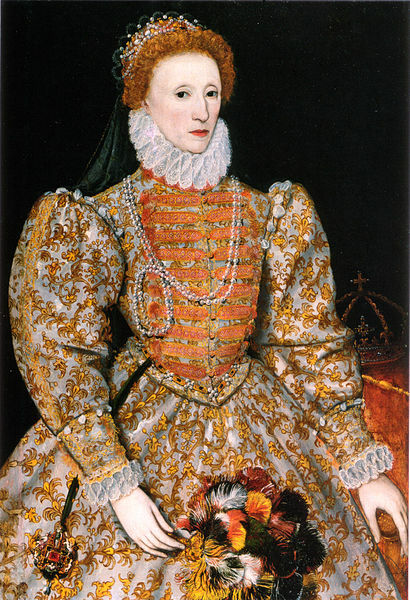 At length in the reign of Queen Elizabeth the power of creating monopolies began to be grossly abused ; and, as soon as it began to be grossly abused, it began to be questioned. The Queen wisely declined a confrontation with the House fo Commons backed by the whole nation. She frankly acknowledged the reason for the complaint: She cancelled the patents [monopolies] which had excited the public clamours; and her people delighted by this concession, and the gracious manner in which it had ben made, did not require from her an express renunciation of the disputed prerogative [to grant monopolies]. This is not to say that disputation of the prerogative didn’t unfold with more history involving her successor monarchs. Lest one think that the British practice of government granting and enforcing monopolies is all part of the far distant past it ought to be remembered that the Mahatma Gandhi-led salt march (Salt Satyagraha) that was an important part of the Indian independence movement was a march in opposition to the British salt monopoly in colonial India. Did you see director Richard Attenborough’s 1982 film “Gandhi”? The monopoly was used to prevent the Indian people from gathering the salt they could otherwise cheaply produce for themselves. In the colonial times of our own American Revolution of 1776 monopolies, though they may not have been banished before the revolution, were not well regarded. Adam Smith’s “Wealth of Nations” first published on the 9th of March, 1776, uses the words “monopoly” or “monopolies” over 200 times. As favorably disposed as he was to the benefits of a free market (his famous “invisible hand” being regarded as virtually sacrosanct in the U.S.) none of Smith’s references to monopolies are complimentary. There are those who say that Smith’s furious opposition to the monopolies helped fuel his writing of the book. And given that he was opposed to monopolies it is not surprising to observe that Smith abhorred their being assisted or brought into effect through government. 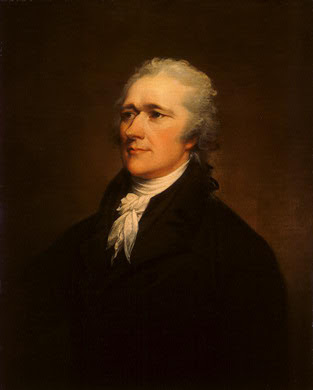 I am indebted to the Lewis Hyde “Common as Air” book (referred to above) for pointing out that when adoption of the U. S. Constitution was being negotiated and Thomas Jefferson famously wanted, as an essential safety measure, to include a bill of rights he wanted that bill of rights to include a provision restraining monopolies. Noticing New York previously covered the topic of what the Founding Fathers would think of Atlantic Yards: They wouldn’t like it. (See: Tuesday, November 10, 2009, Judicial Review of Atlantic Yards Corruption: Laws Should Not Be A "Dead Letter"). 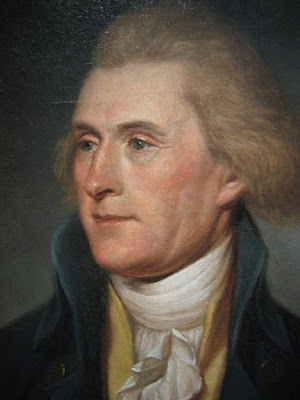 A bill of rights is what is what the people are entitled to against every government on earth, general or particular, and what no government should refuse, or rest on inference. . . .
. . . . [it should provide] clearly and without aid of sophisms for freedom of religion, freedom of the press, protections against standing armies, restriction against monopolies, the eternal and unremitting force fo habeas corpus laws, and trial by jury in all matters of fact triable by the laws of the land and not by the law of nations. With regard to Monopolies they are justly classed among the greatest nuisances in Government. If the Constitution had actually eventually included “restrictions on monopolies” would the government-assisted Ratner monopoly have been permitted? 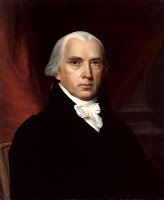 Madison expressed to Jefferson his suspicion that an enumeration of rights “however strongly marked on paper” would simply be overridden if there wasn’t sentiment on the part of the public majority* to continue honoring them. 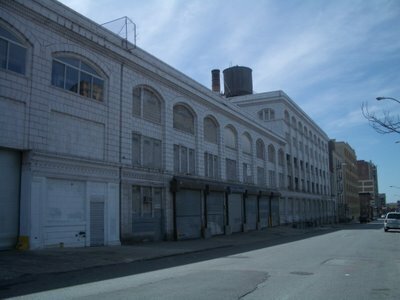 It is conceivable that one more Bill of Rights provision saying that Atlantic Yards constitutes an unprincipled wrong would have prevented it, but perhaps that provision would have been just as easily ignored by the courts as they ignored the state agency override of federal and state constitutional provisions against eminent domain abuse. So there is the government tradition of government awarding monopolies to favored individuals like the numerous monopolies awarded by Queen Elizabeth I when she was `grossly abusing’ her royal prerogatives . . . or the Bloomberg and ESDC’s handout to Ratner of his mega-monopoly. There is also the opposing tradition of restricting monopolies as was envisioned by Jefferson and as underlies the idea of breaking up monopolies and the Sherman and Clayton antitrust laws. “Restrictions on monopolies” may also be said to include effective regulation of monopolies when it it is thought to be necessary to consent to their existence at all. And then there is one more tradition of relationship between government and monopolies: Of all of the traditions it is the most insidious. The most insidious relationship between government and monopolies is the relationship that looks like regulation to constrain the monopolies but is really the reverse. It is when government regulators are “captured” by the industries they regulate and under cover of “regulation” help the regulated monopoly maintain or enhance that monopoly. 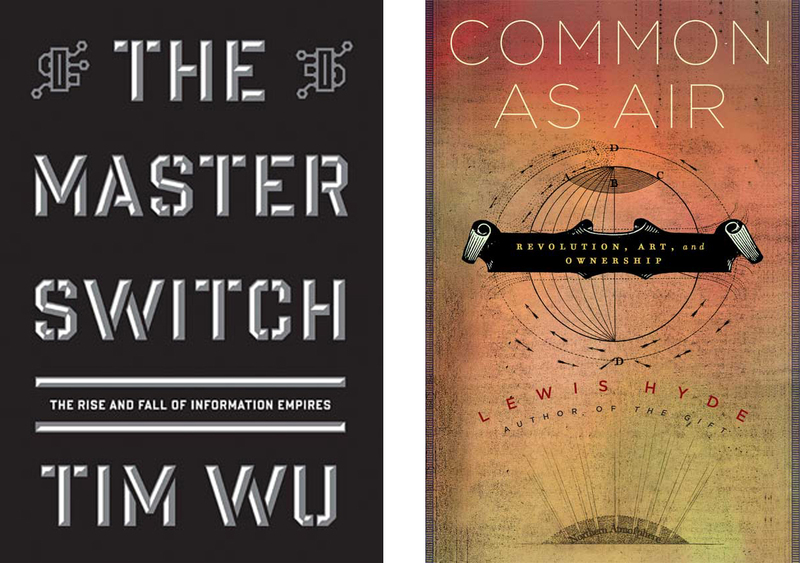 Tim Wu in “The Master Switch” credited Theodore Vail for his earnest consent to be regulated for the public good. He also has stories in the book about the effective use of antitrust law to break up monopolies such as the early Edison Trust and later the Hollywood studio system monopoly. The Edison Trust that monopolized the early movie industry dictated that all movies had to be of a short (Nickelodeon) length and that none of them should have stars. 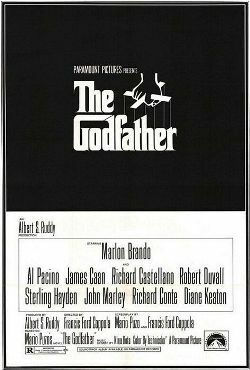 Pursuant to a 1948 U.S. Supreme Court decision the vertically integrated studio system (production+distribution+exhibition) was broken up, which Wu argues made possible such films as "The Godfather." 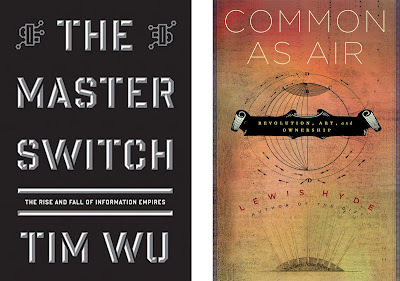 Nevertheless, much of Professor Wu’s book is about how regulators often colluded with (or were bamboozled by) the monopolies they were regulating to help them maintain or strengthen their monopolies. Wu describes the various ways in which this was to the public’s detriment. Wu describes how a regulated radio industry held back the technological development of both television and FM radio because those new technologies threatened to displace the existing AM radio monopolies and their business model. Despite being a regulated “common carrier” that was supposed to provide equal access to all, the phone company used the pre-existing monopoly it had on the use of high-quality long distance phone lines to get a piece of the action in controlling of the radio waves. Wu describes how the culture of these emerging industries might have developed differently and in a more natural and organic fashion had these controls not been so tightly exerted. At one point Wu's thinking and analogies even take him to some mentions of Jane Jacobs urban development parallels (pages 200 and 297). Olympian planners like Robert Moses [upon whose development paradigms Ratner’s Atlantic Yards design is closely modeled] were going wrong. There was no understanding, let alone regard, for the organic logic of the city’s neighborhoods,* a logic discernible only on foot. The twenty-first century begins with no such predilection for central order. In our times Jane Jacobs is the starting point for urban design, Hayek’s critique of central planning is broadly accepted, and even governments with a notable affinity for socialist values tout the benefits if competition, rejecting those of monopoly. The Atlantic Yards megadevelopment exemplifies virtually every complaint Jacobs had about central planners like Moses. 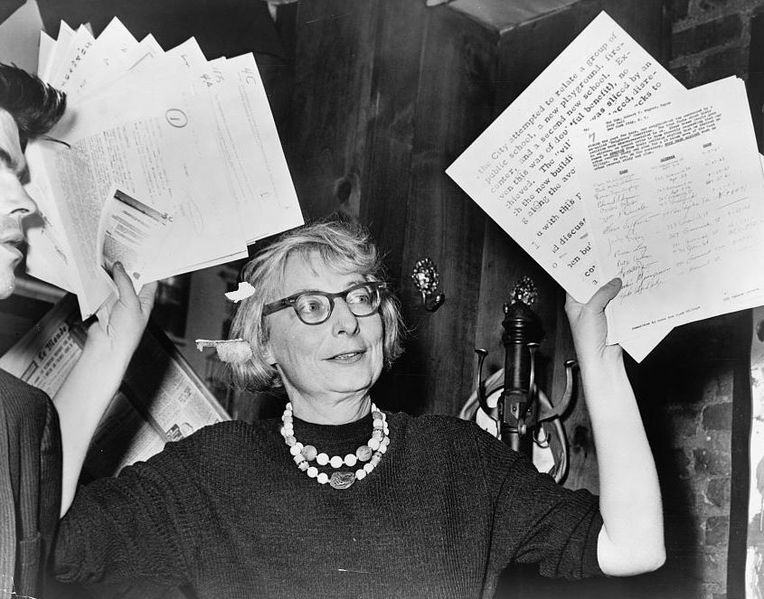 (See: Tuesday, November 11, 2008, Jane Jacobs Atlantic Yards Report Card.) Among other things Jacobs didn’t like were monopolies. Monopolies gratuitously harm cities and suppress what their economies are capable of achieving. The usual objection to monopolies is that they charge extortionate prices and make unconscionable profits by cornering a market, From this it follows that monopolies can be rendered harmless if their prices or profits are regulated. If, at the same time , a case can be made for economies of scale by protecting monopolies from competition, they can be thought of as beneficial. But extortionate prices, harmful though they certainly are, are the least of the disadvantages of monopolies, for monopolies forestall alternative methods, products, services. This often becomes most obvious when monopolies are broken. For more of this kind of thinking you can read what Jacobs says about how “company towns” are not conducive to the promotion of urban economic growth in her 1969 book “The Economies of Cities” (pages 37, 89, 97-98, 102, 127, 143-144, 231). In one of his most chilling descriptions of how “regulators” can team up with the regulated to further the unfair advantages of those building monopolies. Wu describes how in Rick Perry’s Texas (in 2003 George W. Bush had already moved on to the White House) “with a hundred registered lobbyists working in Austin- - as opposed to the 181 members of the [Texas] legislature” Southwestern Bell Company and the legislature came up with a scheme of laws and regulations to freeze out SBC’s competitors. This aided in the reintegration and reestablishment of the once broken up phone company as a monopoly that is much the equivalent of what it had been before (except that in the interregnum there had been a revolution where everyone in America got more sophisticated phones, modems and the Internet). One frightening thing mentioned in Professor’s Wu’s book (and I am not sure mention of it can be found anywhere else) is that at the same time that phone company was assisting President Bush to violate federal law pursuant to a secret executive order by assisting the National Security Administration in the warrantless monitoring of telephone and Internet communications on a vast scale even now not full disclosed, the phone company's pending plans to reintegrate its monopoly were under review by the very same Bush administration. The full extent of exactly what may have happened has not been investigated and may never get adequate attention because in July of 2008 Congress passed a law granting AT&T and Verizon full retroactive immunity for any violation of the laws against spying on Americans. If only the telephone company had told the Defense Department about magnetic recording tape before they discovered the secret by capturing the German machines! 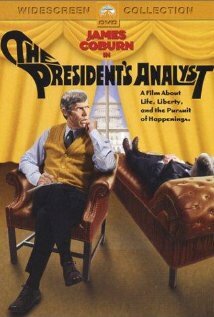 Jame Coburn starred in a 1967 satire “The President’s Analyst” involving all sorts of secret CIA type activity. I thought the film was impossibly over the top when it reveled that behind all the double-crosses going on the (pre-breakup) phone company was the real villain implementing a secret plot. Now, reading Professor Wu’s book I have been forced to wonder whether the screenwriter knew a lot more about Washington and the phone company than I ever could have imagined back then. If we have gone a little far afield at this point it has mainly been to stress the point that monopolies that are supposed to be “regulated” are frequently not that at all. Frequently, as can be seen with Atlantic Yards, the monopolies are the ones in charge, the ones running the show. Were the Ratner Atlantic Yards mega-monopoly to continue there would be a desperate need for it to be regulated. But that seems hopeless. To be effectively regulated Governor Cuomo would have to appoint to the “regulating” Empire State Development agency (once “Corp.”) public officials with a true regulatory mind set. It is fair to bet that the appointment of Joe Chan to ESD does not represent such an approach. Instead, Chan has always been an unquestioning, reflexive supporter of Ratner’s vision of a full-blown unregulated what-Ratner-wants-is-what-Ratner-gets venture. The community, particularly the entity Brooklyn Speaks, has been crying out for greater regulatory control and accountability. Chan’s appointment seems like a clear signal from Cuomo that it is not going to be delivered. It appears to be a clear signal from Cuomo that he condones Ratner’s capture of the “regulating” ESD agency. How much more unregulated could the Atlantic Yards mega-monopoly be? It seems that we are headed in a direction that will show us. What does this permissive Cuomo attitude toward regulatory agency capture bode for the future of hydrofracking in New York State? 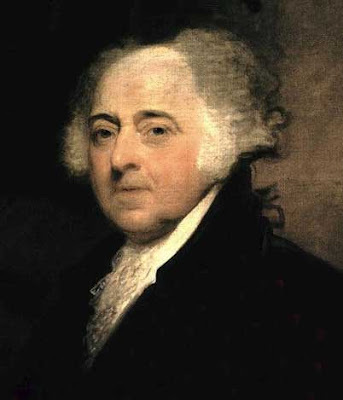 The fact that Mr. Adams got kudos for simply showing up demonstrates the extremely low bar to be met when state officials are performing this secretarial keep-away-the-riff-raff function. (Remember that at the root of the word “secretary” is “secret.”) We refer you to the Atlantic Yards Report post for a full dissection of what transpired during the evening, but showing up uninformed about the project (and alternatives to it), saying that you will check out available information, not letting your attending staff supply available information is all part of a running interference game. Once in a while, if you are lucky in this game, a senior state official will in a public appearance let slip out accurate information of substantial importance, such as when former ESD CEO Marisa Lago said that the megadevelopment would be taking “decades” to build (like the 40+ year Roosevelt Island development) rather than the advertised timetable, and which remark was later hanging out bizarrely while Forest City Ratner and ESD lawyers jointly tried to convince a state judge that the projected 10-year time frame of the environmental impact was nevertheless accurate. If the game begins to wear thin after a little while it doesn’t really matter because in all likelihood there will, soon enough, be a new set of state officials running interference, while behind the door, still in charge, Forest City Ratner will still be Forest City Ratner. It doesn’t really matter that Adams took the position that there was no need for the creation of a new state entity to oversee the monopoly. The fight for a new governance entity is almost certainly the wrong fight. Brooklynites could win the battle for the creation of such a new entity and still lose the war when, inevitably, the huge Forest City Ratner monopoly captures the new entity just as surely as ESD has been subjugated. Those who want to struggle to refine the megadevelopment’s regulation have their eye on the wrong ball. This Noticing New York essay has spent a great deal of time to drive home two critical points. Maybe you think that in doing so we have hammered the nail well below the surface of the wood. The first point is that monopolies are not good things. Having been generally disliked since at least the 1600s that point seems simple enough and it is one that has long been generally agreed upon even if these days people do not routinely keep in the forefront of their minds all the reasons why monopolies are bad. The second point is more elusive and one that the general populace, thinking things to be different, may be less mindful of: That attempting to mitigate the harm of monopolies by government regulation is a treacherous proposition inclined to backfire. One negative result to be prepared for when you attempt to regulate monopolies is discovering that your government representatives no longer work for the public, that they are working instead on behalf of the very monopoly they were supposed to regulate. Together these two things suggest one common sense approach when you confront a monopoly: Dismantle it whenever you can, whenever you have the opportunity. That is what should be called for in the case of Atlantic Yards. A Press Release From BrooklynSpeaks and Develop Don't Destroy Brooklyn Calling For What? • Build first on currently developable parcels, deferring the costly Vanderbilt Yards platform. • Develop affordable housing in the manner and context of recent successes nearby. • Open the development to additional teams in order to distribute the investment, the risk and the total work effort. • Bring the community and its elected representatives to the table so we can all work together and win. Does the third of those points, “open the development to additional teams,” with its ensuing etc eteras mean anything other than dismantle the Ratner mega-monopoly? Wouldn’t it be more courageous, frank and evocative of principle to simply say “dismantle the Ratner mega-monopoly and bid it out properly to multiple developers”? As for the second point, “Develop affordable housing in the manner and context of recent successes nearby,” that is possible code for a number of requests: Give us back our Ratner-seized streets and sidewalks (our res publicae) and build at a more natural and more neighborly contextual density like the successful affordable housing in the10-story Atlantic Terrace project recently built across the street by the Fifth Avenue Committee. Further, what ought also to be implicit in this, and probably is intended to be, is that the subsidies granted to the project should be no more lavish for the acres owned by any Atlantic Yards owner than for the acres just across the street. Lastly, isn’t this a call for preservation of the existing buildings within the footprint that can be preserved and adaptively reused? All of the above translation with respect to the second point may also be thought of as a response to monopoly because it requests the undoing of the Ratner monopoly override of standard laws, regulations and conventions. 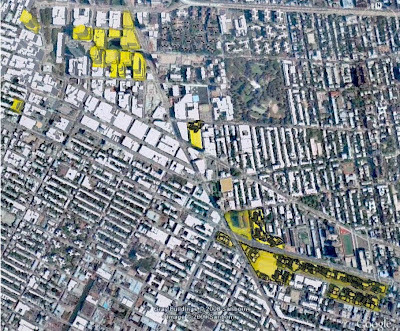 Here is a suggestion: Address a number of these matters simultaneously by saying that public funds should not be used to subsidize the mega-project’s excessive density and call for a per-acre limitation on subsidies (that excludes seized streets and sidewalks from the acreage calculation) that should not exceed what developers of normal density projects ordinarily get. This would help take the profit and the wind out of the sails of the Ratner’s eminent domain abuse monopoly. The fourth point about working with “the community and its elected representatives” would be ho-hum in the nondebatability of its sentiment except for the exceptional shut-out that has, with ESD’s assistance, prevailed to date. That leaves the mysterious and perhaps questionable strategy behind the bullet point oddly chosen as the lead-off to all the points. What strategy is behind calling for the deferral of building on the Vanderbilt Yards until after other construction? A hope that, given time, Ratner will default and lose the sweetheart deal where the MTA gave this land away to him for less than its value? That deferral afford the possibility that the MTA would get the new rebuilt railyards it originally wanted and probably needs rather than the diminished yards Ratner wants to furnish? That deferral of building on the “costly” platform would deprive Ratner of his arguments for absurd density? That Ratner should have to replace, last-out-first-in style, the buildings like the Ward Bakery building that he destroyed to pressure and deprive the community of alternative to his monopoly project? Build first that which can be built most quickly especially if it is at a normal density? Noticing New York concurs with Atlantic Yards Report that the open railyards might be considered, on a relative scale, the most “blighting” of the mega-projects acres. Certainly, if there was any blight at all before Ratner’s blighting demolitions it would only have been the railyards. Whatever the reason and thinking behind this particular bullet point it is too confusing for it to be the lead demand. • Dismantle the Ratner mega-monopoly and bid the land out properly to multiple developers (and don’t use eminent domain except to reclaim land from Ratner). • Do not publicly subsidize extreme density or the seizure public streets and sidewalks: Instead, give the public back its streets and sidewalks (and add more to make connections over the railyards) and place a fair per acre limit on subsidies (that excludes the acreage of Ratner-seized streets and sidewalks) that will not exceed per acre what developers of normal density projects ordinarily get. • Listen to the community and its elected representatives who have already offered you their U.N.I.T.Y. to let you know what they want. • Build first on vacant acres preserving to the extent practicable the existing buildings within the footprint for adaptive reuse. The `project plan' is indeed the `constraint' that stands in the way of healthy development in the neighborhood precisely because it is entirely designed as a Ratner blueprint for monopoly. If it was agreed that BrooklynSpeaks and Develop Don't Destroy Brooklyn were to get absolutely everything on their mildly expressed bullet-pointed wish list except for a breakup of Ratner's monopoly, the booby prize would be that it could only be delivered by some form of regulation . . . and the regulating state official might be Joe Chan unless the community managed to win another resultant fight. The answer, the only answer, is to break up Ratner’s mega-monopoly. Those who think the answer is to more effectively and meaningfully “regulate” Ratner’s monopoly are wrong. This is not 1913 when phone company president Vail was amenable to constraints to provide public benefit. Times have changed. The regulated have changed and the regulators have changed. You cannot expect to regulate a mega-monopoly like Ratner’s with politicians like Bloomberg and Cuomo in office. And you would still need an independent judiciary to enforce the law. 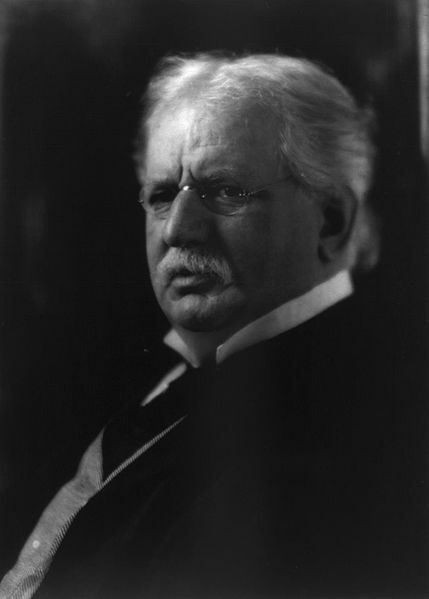 Whereas once Professor Wu might have surmised that regulation of the 1913 phone company was tantamount to being ineffectual because it was superfluous to the good intentions of phone company president Theodore Vail, regulation of the Ratner mega-monopoly is, per se, going to be ineffectual for another reason: Because Ratner, running the show, will simply shrug off any meaningful restraints that the misguided struggle to impose. The music is very near indeed! An Insert Preview - Music Superstar Ethics: How Completely You Can Sell “You can say what you say, but you are what you are.” Jay-Zzzzus! The "Boardwalk Empire" Strikes Back? 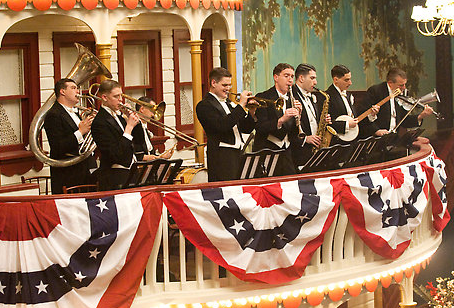 When it comes to local music opportunities here is something exciting that was totally off my radar screen: Local New Yorker and Brooklyn resident Vince Giordano is performing a key role in generating the period music for HBO’s “Boardwalk Empire.” When I heard this I quickly checked in with my Tivo to catch up with some of music I was missing. 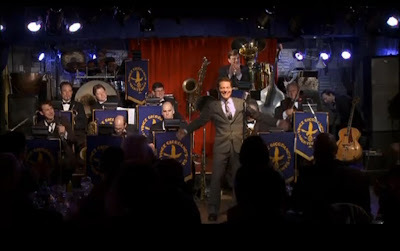 Last year’s season closer ended with a beautifully resurrected, stunning and languorously philosophical George M. Cohan song (performed by Stephen De Rosa) to which I had not previously paid attention: “Life's a Funny Proposition After All” (from “Little Johnny Jones” the same show as “Yankee Doodle [Dandy] Boy”). To imagine that he could write it is a whole other window into who George M. Cohan was. 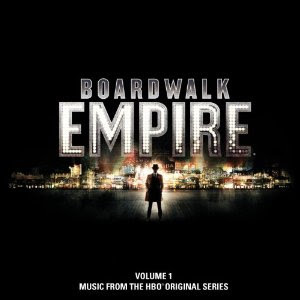 If you missed the music in the early episodes or want to hear it again you can now get a lot of it, including the new Stephen De Rosa version of George M. Cohan’s song on “Boardwalk Empire: Volume 1, Music From the HBO Series.” Rick Florino says “Due to Giordano's diligence, it's one of the best soundtracks of the year.” It is certainly hard to find a anything better than this ever. Among other things the soundtrack has Nellie McKay going even more retro than her Doris Day tribute album, “Normal As Blueberry Pie.” Ms. McKay singing “Wild Romantic Blues” channels Jane Green, a Broadway star of the 1920s who tragically just disappeared mysteriously. You may also notice some coincidental overlaps or near overlaps with First Acoustics. The "Boardwalk Empire" volume has songs by two members of the Wainwright family: Loudon (Wainwright III) and Martha. 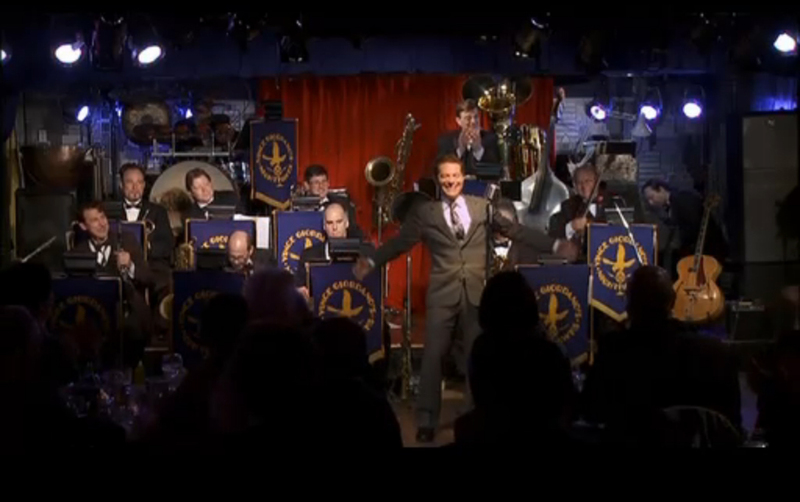 Previously, Vince and the Nighthawks (and Randall Poster, the music director on "Boardwalk Empire") worked with Rufus Wainwright on the soundtrack for “The Aviator” when Rufus performed “Stairway to Paradise.” As you see, Sloan Wainwright will have a March 24, 2012 performance. 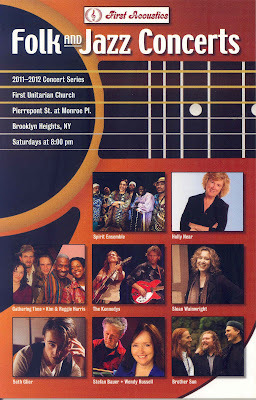 (Family tree-wise, Sloan is the sister of Loudon Wainwright III. Rufus and Martha are the children of that Loudon and singer Kate McGarrigle of the McGarrigle Sisters.) 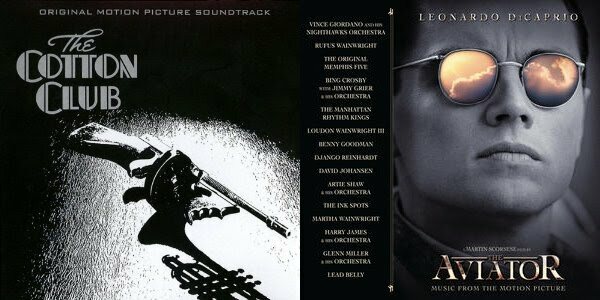 Another overlap: Leon Redbone, who previously did a First Acoustic Performance, is on the album performing, “The Sheik of Araby.” When Redbone performed at First Acoustics Vince backed him up playing bass. Funny how overlaps accumulate: "Boardwalk Empire" star Steve Buscemi had something of a breakthrough role in the 2001 movie “Ghost World” for which Vince and the Nighthawks provided a significant portion of the soundtrack. Other vocalist performers on the "Boardwalk" album include: Regina Spektor, Catherine Russell, Kathy Brier, Lauren Sharpe, and Amber Edwards plus there is some ragtime piano by Mark Shane. Seeing Vince and the Nighthawks has got to be one of the best bang-for-your-music-buck deals in the city. You will probably feel still flush enough upon departing to add several CDs to your collection on way out and Vince will probably be happy to autograph them. Door cover is $15. Food (and drink) is reasonably inexpensive and pretty decent. Did I forget to say that there is a dance floor and there are usually some very good dancers doing some vintage steps from the period. With a little imagination you can pretend you have walked into a scene from Scorsese's “The Aviator,” one of the several Woody Allen films of which Vince and company have been a part, Coppola's “The Cotton Club” in which Vince also makes an appearance or Babette’s Nightclub in 1920s Atlantic City (in "Boardwalk Empire"). Before we leave the subject of where music and "Empire" conjoin, let’s bring the subject around to some more typical Noticing New York themes. And it will be appropriate if people Googling for music albums with “Empire” or "Empire State" in the title find this post. The problem is that the bad empire-building behavior Jay-Z is supporting is not happening at a safe remove in a by-gone historical era. The damage he is contributing to is going on now in real time. The only good thing good about the fact that it's happening in real time is that this means a conscious and objecting public has options to do something about. Insisting that Ratner's monopoly be broken up and bid out to competing developers would be a good first step in the things to be accomplished. Ensuring that subsidies are fair and minimal with diminished density would be some other good things to accomplish. The title obviously references Billy Joel's “New York State of Mind.” It also, perhaps unwittingly, echos the name of New York’s “Empire State Development” agency just recently known better as the “Empire State Development Corporation” and long before that known as the “New York State Urban Development Corporation” the name enshrined in the statute that created it, when, in theory, the agency was supposed to help the poor. Instead, in Brooklyn, the state agency has earned its new “Empire” name by selling out and devoting itself to the premier objective of seizing land and overriding laws and procedures to build developer/subsidy collector Bruce Ratner a super-sized 50+ acre mega-monopoly. Jay-Z showed up at the press event this week to announce that the Ratner/Prokhorov basketball team, the New Jersey Nets now in New Jersey are being renamed the “Brooklyn Nets.” The team, of course, along with jay-Z, have are being used to justify Ratner’s land grab, receipt of huge public subsidies and override of laws and the community. But the only elected representative at the event was Brooklyn Borough President Marty Markowitz. All other politicians stayed away, although Ratner is still very much reliant on the Bloomberg and Andrew Cuomo backing he gets in the background.
. . . thank you for keeping the faith. Thank you for keeping the faith," he said. "I know the taunts that you receive, and that's saying it nicely. I know. You kept the faith and you realized what this would be for the future of Brooklyn and New York. And I congratulate each and every one of you. Empire building for Bruce Ratner may be getting uncomfortable. 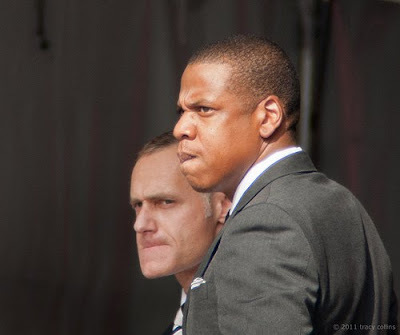 Jay-Z only stayed long enough to bequeath a less-than-a-minute statement of support before he headed into a waiting limousine and while he was there, he and fellow Ratner/Prokhorov henchman, Prokhorov/Ratner (“Barclays”) Center CEO Brett Yormark, were photographed looking rather tense. See Tracy Collins photo below. 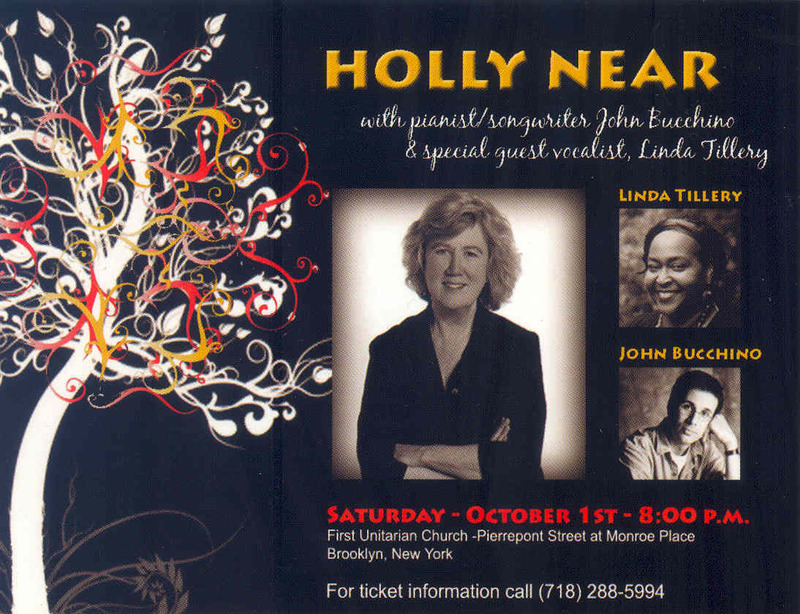 So, if you are interested in a real celebration and some sweet song provided by a dedicated activist for social change I remind you that Holly Near is performing this Saturday night. And if you want an evening away from empire-building gangstas, both today's real life variety (pretending to be nice and community-supporting) or the allegedly too-nice violent 1920s variety on HBO you can settle down and enjoy the same sort of superb vintage music live with Vince Giordano and the Nighthawks two nights a week at Sofias in Times Square. Ostensibly, construction of the Ratner/Prokhorov (“Barclays”) basketball arena for the Nets, which is being erected where Park Slope, Fort Greene and Prospect Heights intersect, is now, and has always been “ahead of schedule.” That’s according to the construction reports prepared by real estate consultant Merritt & Harris, reporting to the trustee for holders of the bonds issued to finance the project. See: Wednesday, September 14, 2011, Latest consultant's report: arena still ahead of schedule (but lead is narrowing), while transit connection is on schedule (but no longer ahead) from which the above charts were cribbed. But if construction of the arena is really on schedule, why has it been necessary for some time to accelerate with the shift to a 24/7 round-the-clock construction regime with night time jackhammering and weekend work happening on both Saturdays and Sundays throughout the project footprint? Why is it necessary for the developer/subsidy collector Bruce Ratner’s Forest City Ratner's construction people to get after-hours variances for such increasingly continuous work (which they secretly lie to obtain) except for the fact that work is actually behind schedule?. . . That is unless the round-the-clock scheduling of work was always an intended part of maintaining the construction schedule, in which case the environmental impact statement intentionally avoided depicting with truth and accuracy what was to befall the community? 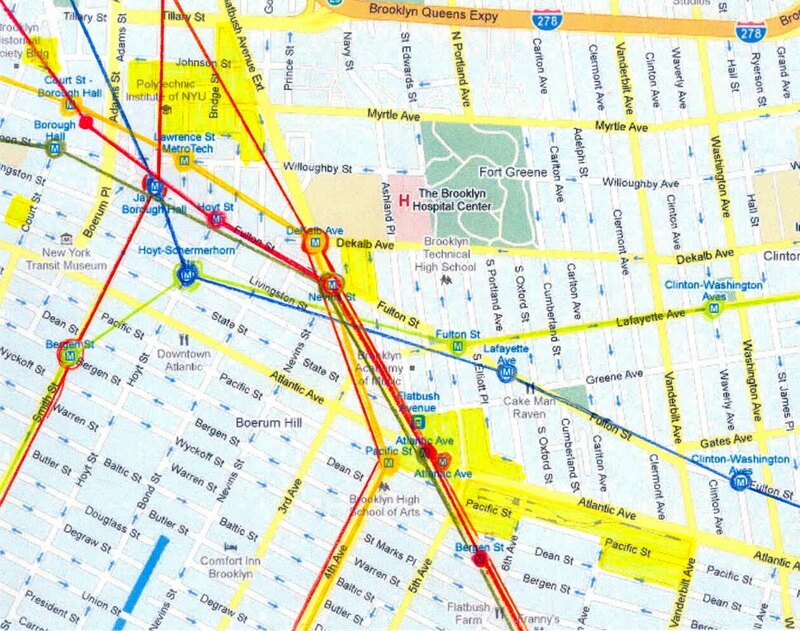 Atlantic Yards-related work extends to 24 hours a day, resulting in many reported quality of life impacts, Submitted by Peter K. on September 15, 2011. We have actually been privately skeptical from the beginning about whether reports that the arena construction was on schedule were accurate, ever since the first report that came out was accompanied by a quickly reissued “corrected” chart revised specifically with respect to its main subject: exactly how far along construction actually was. 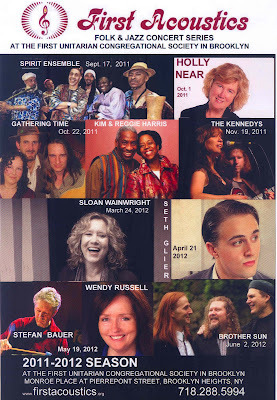 See: Thursday, March 10, 2011, Arena slightly ahead of schedule, consultant reports, but "schedule disputes" linger; report reissued after chart errors found. But what do you do with private skepticism and suspicions about whether there has been PR-motivated rejiggering of information when you are on the outside looking in at an opaque process perpetually hidden behind a PR haze? Is the construction of the arena behind schedule despite reports to the contrary? . . . . Because, if it isn’t. . .
Doesn’t that mean that the near continuous construction . . . . late at night and through the early morning hours, on Saturdays and Sundays as well as weekdays. . . . (permitted by virtue of special questionably obtained waivers) was always intended, even while the inevitability of such a schedule was tactically excluded from the Environmental Impact Statement?
. . . . . You can’t really have it both ways . . .
Or CAN you? Is having it both ways something you are allowed if you are Forest City Ratner? Those questions are good, essential questions to ask but there is no guarantee they will get through the gauntlet. The non-public, invitation-only aspect of the event, with questions having to be submitted beforehand, indicates how tightly controlled this event will be, with the community represented only by those who are “invited” to represent the community. Also, although the Monday, September 26th evening event may seem a fair way off, the planners are taking no chances: They wanted all questions submitted almost immediately upon announcement, by September 16th.